Five Institute of Buddhist Studies’ students were presented with their Masters Degrees at commencement ceremonies on Friday, May 20, 2016 at the Jodo Shinshu Center in Berkeley, CA. Rev. Marvin Harada, Vice Chair, IBS Board of Trustees, chaired the event. Bishop Kodo Umezu, President of IBS, and Trustee ministers conducted the opening service. Opening remarks were given by President Umezu and Dr. Scott A. Mitchell, IBS Dean. Mr. Richard Endo, Chairman of the IBS Board of Trustees presided over the Investiture of Rev. Dr. David Matsumoto as the first Provost and Dr Mitchell as Dean of IBS. Dr. Matsumoto present a short video of his presentation of the 3rd IBS President’s Award, to Dr. Alfred Bloom, former professor and Dean at IBS, in Hawai’i. The commencement address was made by Dr. Riess Potterveld, President of the Graduate Theological Union. He emphasized the importance of integrating the things we learn through our education into our very being, for it is that which develops our character, and is the foundation of our future deliberations. Theological education is such that it will influence our ethical deliberations as we go through life. Awards of graduate degrees and certificates was made by Mr. Endo and Dr. Mitchell. Thomas Calobrisi: Thesis: On Mindful Civil Religion: A Study of the Rhetoric of Mindfulness Movement in the United States. Committee: Dr. Mitchell and Dr. Matsumoto. Todd T. Jordon: Thesis: Narrative and Non-Narrative in Buddhist Pastoral Care. Committee: Rev. Daijaku Kinst, Ph.D, and Rev. Seigen Yamaoka, Litt.D. Joanne Laurence: Thesis: Healing Through Death: Integrating Hospice Chaplaincy with Buddhist Healing Principles. 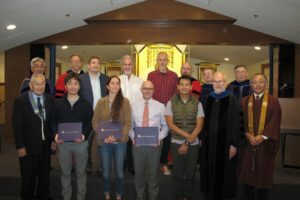 Committee: Dr. Kinst, Dr. Matsumoto, and Paula Arai, Ph.D.
Alistair Shanks: Thesis: An Examination of the Zen Hospice Project Volunteer Training Program: Implication for the Practice of Buddhist Pastoral Care. Committee: Dr. Kinst and Dr. Yamaoka. Pitt Visessuk (Toby): Thesis: Upeakkha (Equanimity) in Definition of Thai Forest Theravada Buddhist Tradition: Application in Chaplaincy and Pastoral Care. Committee: Dr. Kinst and Dr. Yamaoka. Receiving Buddhist Chaplaincy Certificates were: Jordon, Laurence, Shanks, Visessuk, and Kenneth L. Wilson. Yoshinari Hemmi, was awarded a certificate of completion for one year study at IBS, under the Ryukoku University and IBS Exchange Program.